The idea for EXPAIN Change Neck & Shoulders came in 2009. Father (and co-owner) of two of the founders of EXPAIN, Vidar, worked in a lab for biomechanics and had some physiotherapists visiting. 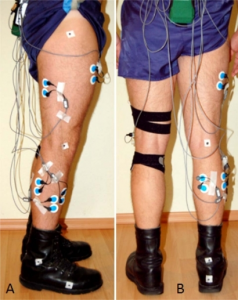 The physiotherapists saw the equipment they used in the lab for measuring muscle activity (EMG), and found this technology very interresting, and wanted to use it in their treatment. The problem was that the equipment had a cost of NOK 200 000 and up, and it almost requred a PhD in signal processing to understand any of it. The brothers and their father got the idea that this could be made smaller, cheaper and easier to use and thus making it available to more people. 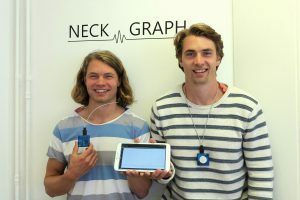 The brothers, Thomas and Einar, started Neckgraph with their father in 2011. Together with a childhood friend (who was studying mathematics at the University) they started with the development in 2011. The first prototypes were hand soldered by Thomas in the living room in the apartment they shared at Bislett, while Einar wrote software in Matlab that could receive and analyze data readings from the muscles. Neckgraph received financial support from Innovation Norway. They soon found out that this equipment had to be done wirelessly, and familiarized with the Bluetooth technology. They first focus was on office workers who spent a lot of time in front of the computer and made software for PC. As smartphone usage accelerated and more and more phones had Bluetooth built in, the brothers quickly turned away from the the PC-plattform and focused fully on the new mobile platforms. After some development and a series of prototypes, the brothers came in contact with SINTEF, through Thomas’ mentor from the University. SINTEF needed EMG equipment for a research project, and considered different approaches; purchasing equipment, self-development and development in collaboration with someone else. They ended in the latter, and the brothers and math-friend moved in with SINTEF in Forskningsparken. The year at SINTEF was well spent and in one year the first marketable product was ready and CE approved. SINTEF got their measuring equipment and Neckgraph was left with a product that had research quality but that few would buy because of poor design and high cost. In October 2015 Neckgraph started cooperation with Unikia. Together they started EXPAIN. Neckgraph transferred technology, IP and manpower to EXPAIN. Unikia would help with design, communication with factories in China and chairman Sverre Steensen, and more. 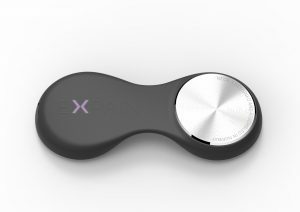 EXPAIN set ambitious goals, including: selling the muscle activity sensor against neck pain to major retail chains and pharmacies within one year of commencement. In order to offer products not only against neck pain, EXPAIN set out to increase the number of products from one to 8-10. 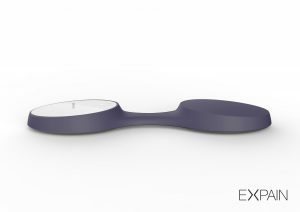 EXPAIN Change Neck & Shoulder was quickly sketched by the chief designer for Unikia and the goal was to create a product for the consumer. Expain did all electronics developments for the Change products in-house. This meant we were more flexible regarding design changes and customization of electronics and different solutions. Early on, we tried on a two-part form in which the electronics were in one part and the battery was in the other. We worked hard to try to find the best possible fastening mechanism against the skin. We needed superior signal quality, it should sit firm against the skin, and the fastener would have to withstand several days of use. We worked with several factories in China and Norway to find the best possible solution with regards to price, quality and a production time. It turned out that this solution demanded plastic molding in two rounds and advanced and time-consuming installation. Because of this, the design was modified and adapted to production in Norway. 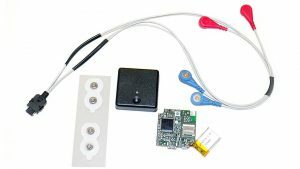 It turned out that it was easier and cheaper for a Norwegian manufacturer to make and assemble electronics with the specifications and requirements of small size and accuracy that we required. We ended up with a solution that met our specifications, could be mounted in Norway at a cost that will give us a reasonable retail price. Production supplier became Norbit EMS at Røros. 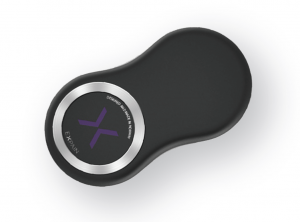 EXPAIN Change is based on reseach on muscle activity and pain, sustained muscle activity and pain and Biofeedback as a pain relief treatment. The effect of work-related sustained trapezius muscle activity on the development of neck and shoulder pain among young adults. Read. Long periods with uninterrupted muscle activity related to neck and shoulder pain. Read. Trapezius muscle EMG as predictor of mental stress. Read. Meta-analysis of biofeedback for tension-type headache: efficacy, specificity, and treatment moderators. Read. The impact of biofeedback training on muscle activity and rest in trapezius during vocational computer work: a randomized controlled trial. Read. Comparative Study Between Auditory, Visual and Combined EMG Biofeedback in Management of Patients with Tension type Headache. Read. Comparing biofeedback with active exercise and passive treatment for the management of work-related neck and shoulder pain: a randomized controlled trial. Read. Change Mechanisms associated with combined relaxation / EMG Biofeedback training for chronic tension headaches. Read. Project report: Measures intended to reduce undesirable strain in the neck shoulder region. In people who regularly work on terminal / PC and disorders in the neck-shoulder region. Read (Norwegian). Check out this video featuring the production facilities at Norbit EMS (Røros) for a quick insight in production of the EXPAIN Change devices (Norwegian). If you are interrested in purchasing one of the Change devices, press to buy the EXPAIN Change Neck & Shoulders or EXPAIN Change Arm.